Journal : The Australasian Medical Gazette ; vol iv., December. Sydney : L. Bruck, 1884-1885. Description : pp. 62-64, [2 pl.] ; ill., 4 photo. ; 25 cm. Photographs : 2 leaves of heliotypes ; 4 figures. Photographer : John Ashburton Thompson. Subject : Epidemiology — Variola. Corporate authors (mostly Thompson's report to the Board of Health). Led to disciplinary actions against the primary physicians, Eichler and Donovan. Thompson revised and republished this report in 1886. Several of these cases being so typically variola, the idea struck Dr. Mackellar, the Principal Medical Officer, that it would be of great advantage and importance to have photographs of them. 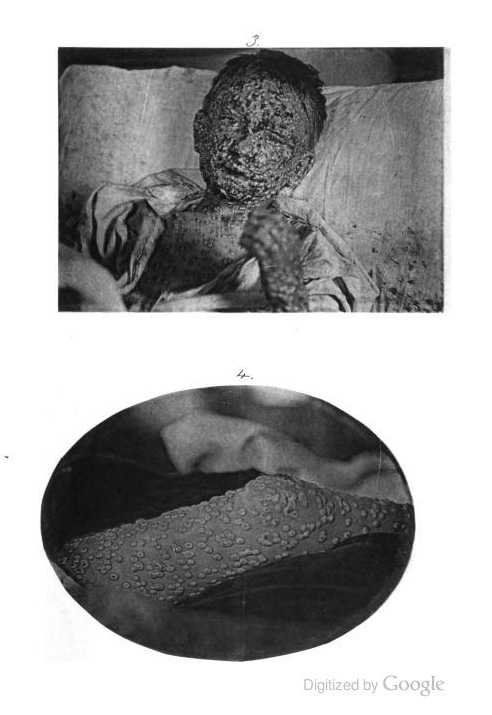 Accordingly, he personally proceeded to the quarantine ground, accompanied by Dr. Ashburton Thompson, who, to his other accomplishments, adds that of being a good amateur photographer, and, with all necessary precautions to avoid bringing away contagion, these gentlemen succeeded in taking numerous admirable negatives of the various cases. 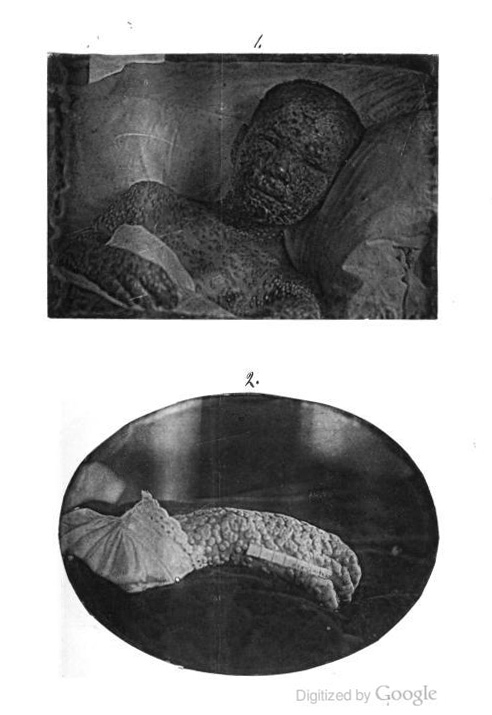 Heliotype prints from four of these, viz., the face and hand of Emma Low (Plate 1 and 2), and the face and leg of Harry Kingsbury (Plate 3 and 4), showing the state of the rash on the ninth day of the eruption, we are, by the courteous aid of the Honourable Geo. R. Dibbs, M.P., the Colonial Treasurer, and of Dr. Mackellar, able to issue, for the information of our readers, in this number of the A. M. G.